Dave and I live in Utah and one of our favorite places to visit is Arches. We take advantage of our close proximity to visit Arches National Park multiple times each year so we are very familiar with the park. One advantage to being a local is the opportunity of taking Arches National Park pictures during every season and all types of weather and light conditions. 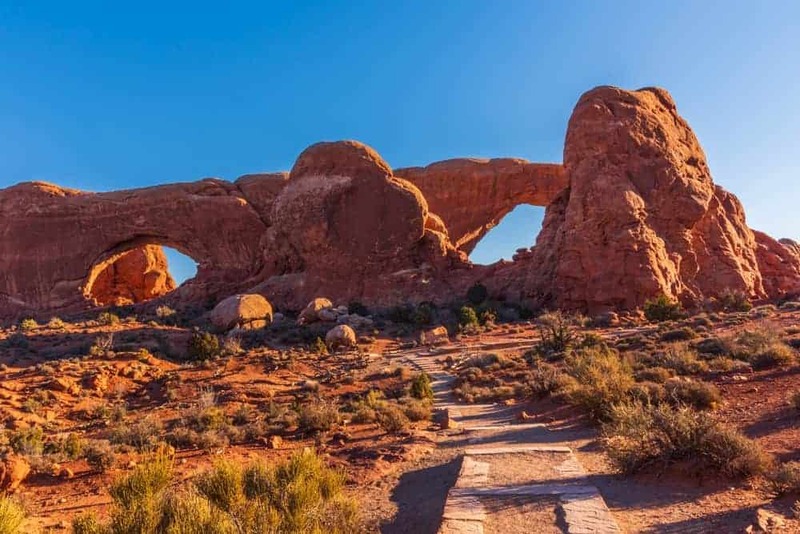 In this article we share our Arches National Park photography tips because taking photos of the top Arches National Park attractions is an important part of the experience. We also have some tips for planning your trip to Arches. Arches National Park, is a few miles north of Moab, Utah (there are some great Moab photography spots too). The park has over 2,000 natural stone arches, hundreds of stone pinnacles rising into the sky, immense rock fins and large balanced rocks. There are a variety of things to do at Arches National Park. Many visitors enjoy the scenery of red rock formations and arches from the car. Others enjoy family-friendly hikes around the arches. Those who want a bit of quiet away from the crowds will hike the longer and more primitive trails. We share a few of our favorite Arches National Park photography spots in this video. SUBSCRIBE to our channel to receive notifications when we post future videos! 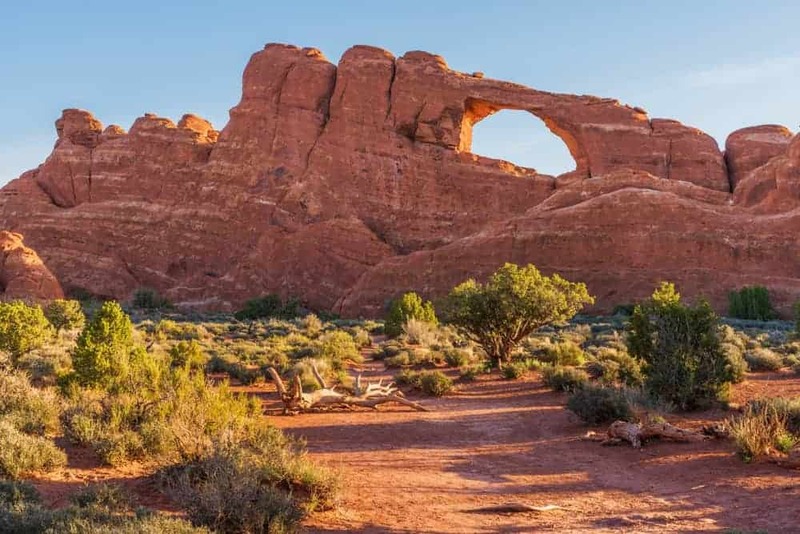 Use our Ultimate Travel Guide to Visiting Arches National Park to plan your trip. TIP #1: Avoid the long lines at Arches National Park entrances and congestion at the parking lots by planning to arrive before 8 am or after 3 pm. Enjoy the park and hiking trails in the cooler temperatures of the late afternoon and evening. 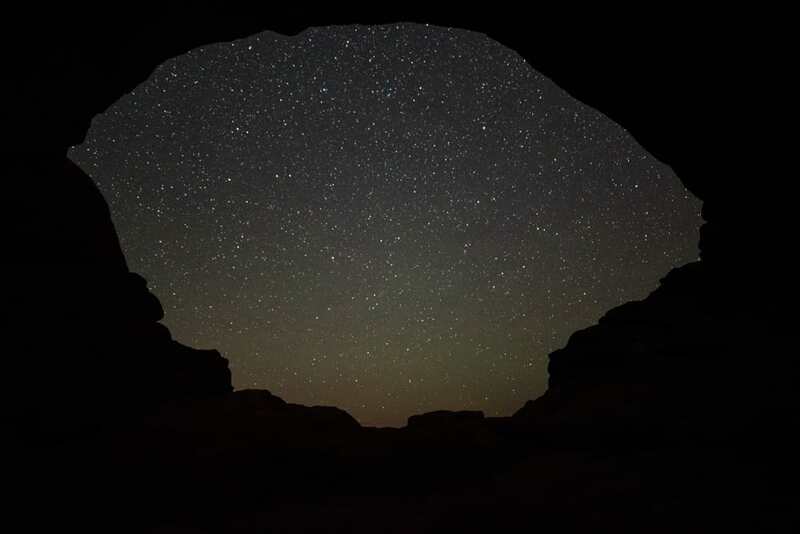 Evening light is always best for photography and the perfect time for doing some fantastic Moab night photography in one of Moab’s many stargazing spots. TIP #2: We like to ‘step off the sidewalk’ to find creative compositions when doing Arches National Park photography or Moab photography in general. And while Arches National Park is beautiful, it’s also very fragile. 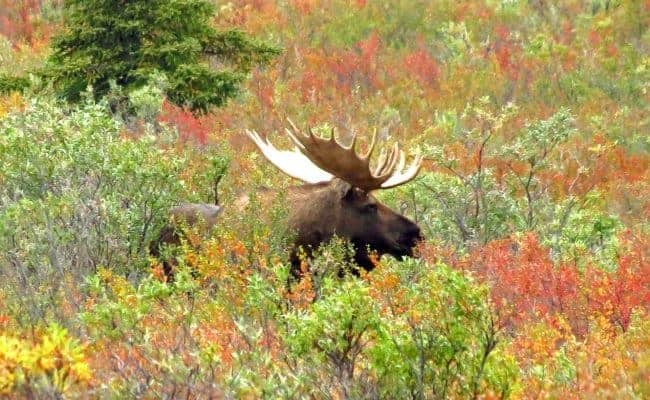 If you step off the trail or away from the pullout, you may damage delicate habitat. When biological soil crust is damaged, it can take centuries to recover. Avoid the soil crust and only walk on slickrock or dirt as you explore. TIP #3: Don’t forget to purchase the US National Parks Pass – it’s a good deal when visiting multiple parks! TIP #4: Visit Arches National Park in the winter during the off-season for cooler temperatures, less traffic and amazing photo opportunities. Read our 5 reasons to visit during the winter. The full 43-mile scenic drive, including the spur roads, takes 2 to 3 hours. 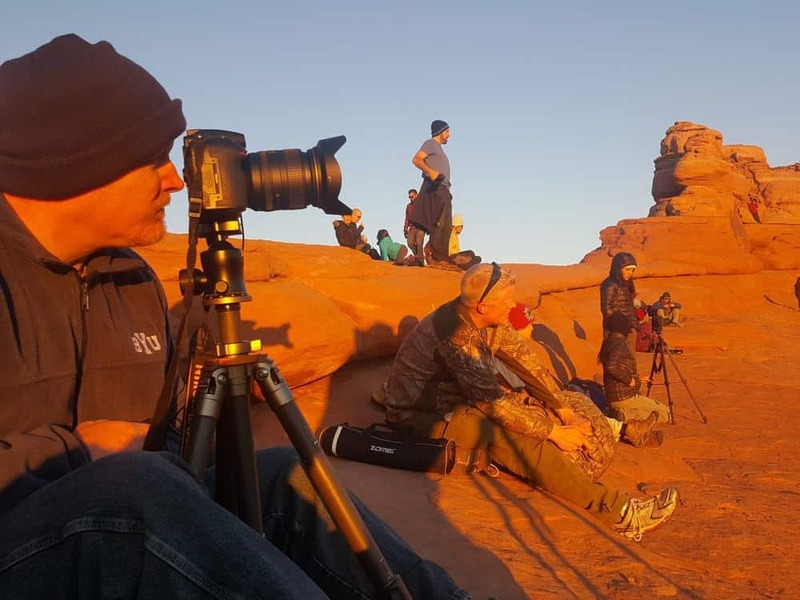 Add more time if you plan to do any serious Moab, Utah photography or hiking. The road is paved and offers Arches National Park photo spots from the pullouts along the road or in the parking lots. Some of the arches and landmarks can be reached by a short walk from the parking lot. This is the first stop as you travel along the scenic drive from the visitor’s center. From the parking area follow the wide, paved trail for about 100 yards to the viewpoint of Park Avenue. It’s an impressive view, but to understand why it’s called Park Avenue, you must follow the trail down and walk between the immense sandstone monoliths on either side. The real Park Avenue in New York City is a wide boulevard with soaring skyscrapers on either side. BEST TIME TO PHOTOGRAPH Park Avenue is middle to late afternoon. The valley is in shadow and the sun lights up the east wall. Definitely stop at this viewpoint where you’ll enjoy a 360-degree view. 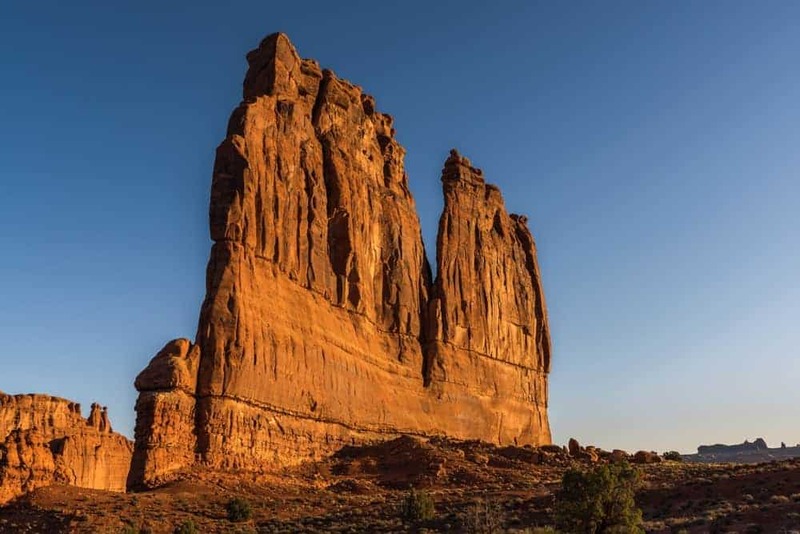 See the La Sal Mountains to the east and distinctive formations like Three Gossips, Sheep Rock, and The Organ in the Courthouse Towers area. Look to the horizon for a distant view of Balanced Rock and the Windows Section. BEST TIME TO PHOTOGRAPH at the La Sal Mountain Viewpoint is sunrise. The light from the rising sun washes the rock formations with a warm red glow. The Courthouse Towers area has unique rock formations to photograph: Three Gossips, Sheep Rock, and The Organ. We found the best places to take photos are from the La Sal Viewpoint to get a distant photo, or stop at the pullouts along the scenic drive. BEST TIME TO PHOTOGRAPH the Courthouse Towers area is at sunrise. The warm light in the morning is the perfect time to capture the red glow on the formations. Balanced Rock is located next to the park’s main road. It is a popular feature in the park. 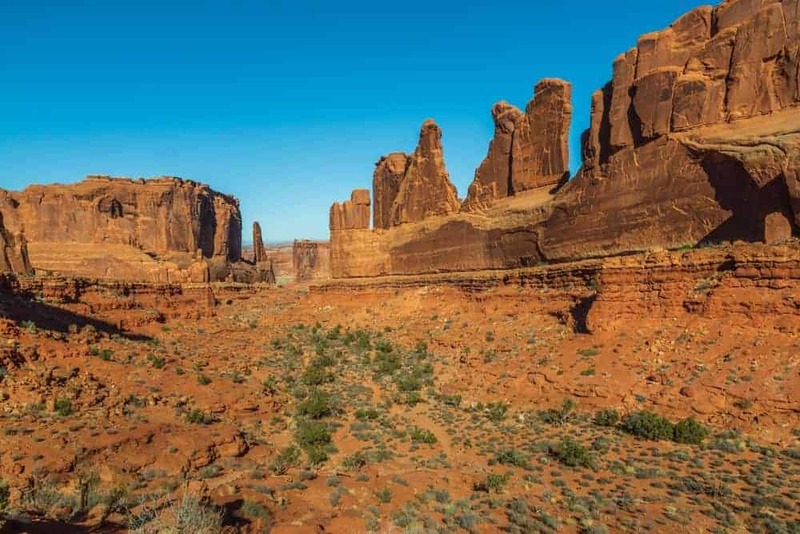 The .3 mile round trip trail is one of the easier Arches National Park hikes that allows you to hike a full loop around this landmark. The impressive fact about this feature is the balanced, upper portion of the rock is as large as three school buses! 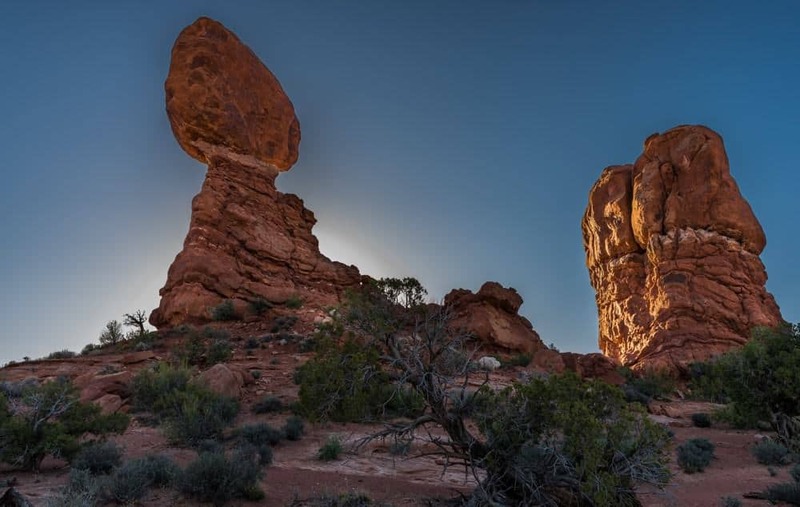 Use the various pullouts along the main road to capture different views of Balanced Rock. Walk the trail and take photos of the balancing rock from different angles. BEST TIME TO PHOTOGRAPH Balanced Rock is sunset and evening. Iconic Delicate Arch is usually at the top of the list when visiting Arches National Park. 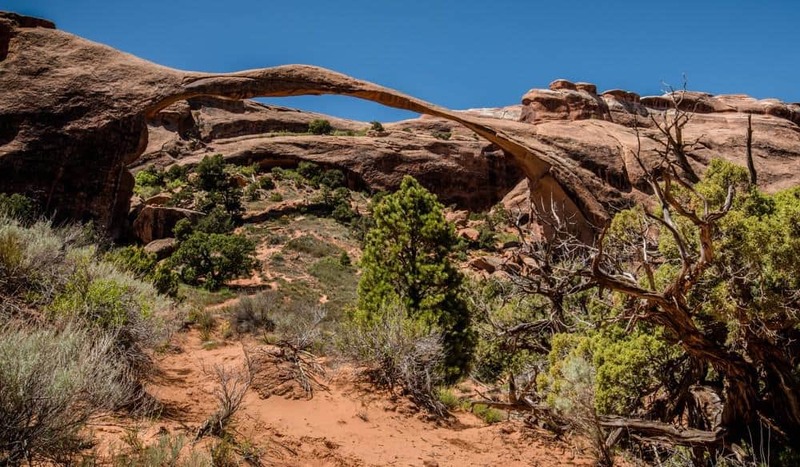 The impressive free-standing arch is a famous geologic wonder. This arch cannot be viewed from the main road and requires a bit of walking to see if from a distance. 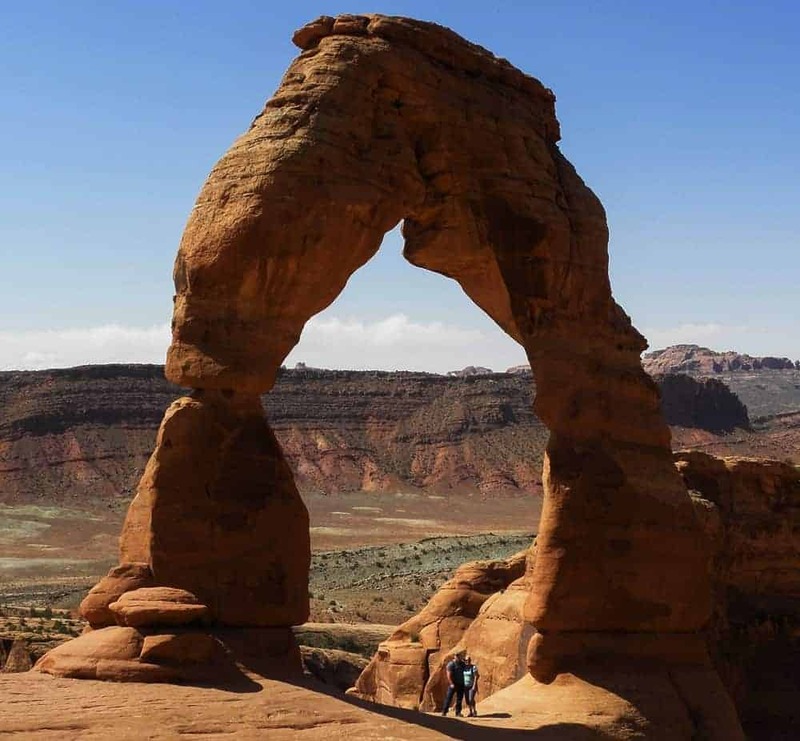 Walk 100 yards along a level path at Lower Delicate Arch Viewpoint to see the arch one mile away. There is an Upper Viewpoint that takes you a little closer, requires walking ½ mile with some stairs. The trail to see the arch up close is 3 miles roundtrip and climbs 480 feet in elevation. The hike is mostly uphill and takes 1 to 1 ½ hours if you are reasonably fit. Delicate Arch is a main attraction at Arches for tourists and photographers who want photos of arches in Utah. Be sure to practice patience and courtesy while you wait your turn to get your picture taken under the arch. Delicate Arch is one of the best sunset spots in Arches National Park. It’s also the time when most photographers choose to line up along the bowl waiting for the magical moment. There could be hundreds of people in the small area during the summer. Arrive at the Delicate Arch bowl at least an hour before sunset to get your spot. Walk around to find a unique composition. Take a headlamp for the hike down after sunset. BEST TIME TO PHOTOGRAPH Delicate Arch is sunset and evening. 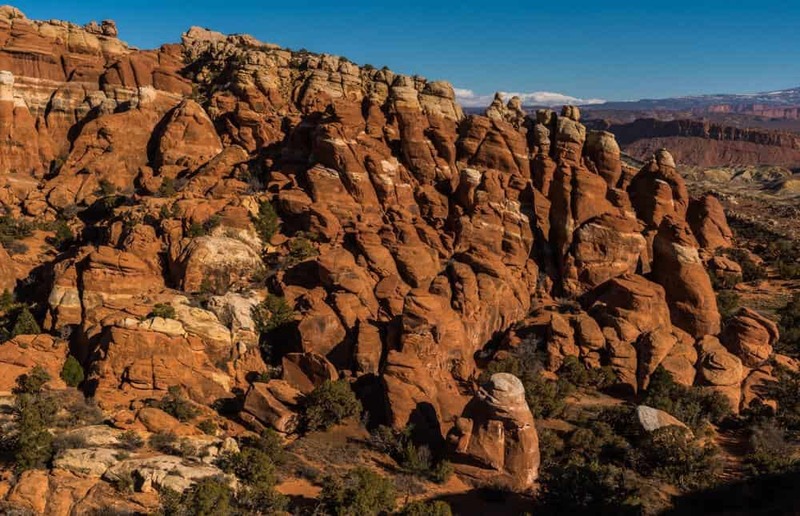 Narrow canyons and maze-like fins comprise the Fiery Furnace. Explore the area safely on a 3-hour, ranger-led hike (make reservations in advance). Learn the history of the park as you scramble over slickrock boulders, walk through sandy trails, squeeze between rocks and navigate narrow ledges. 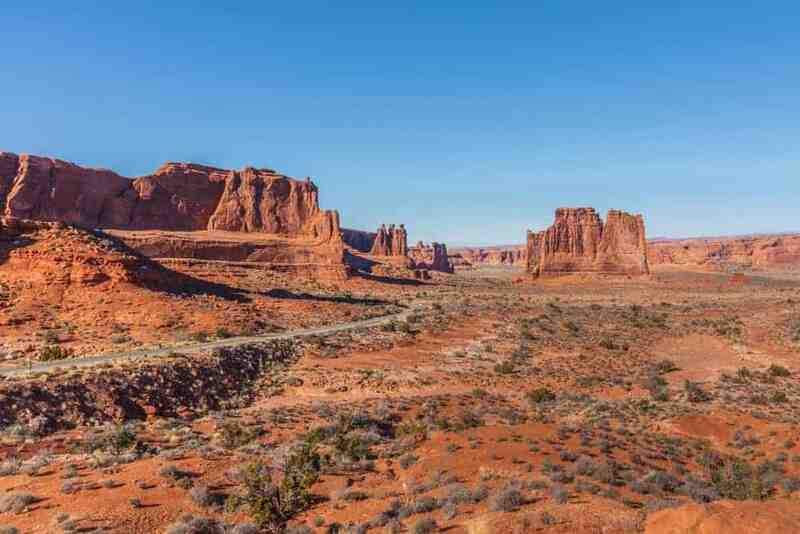 If that sounds too adventurous or you don’t have time, this Arches National Park viewpoint is a short walk from the parking lot. 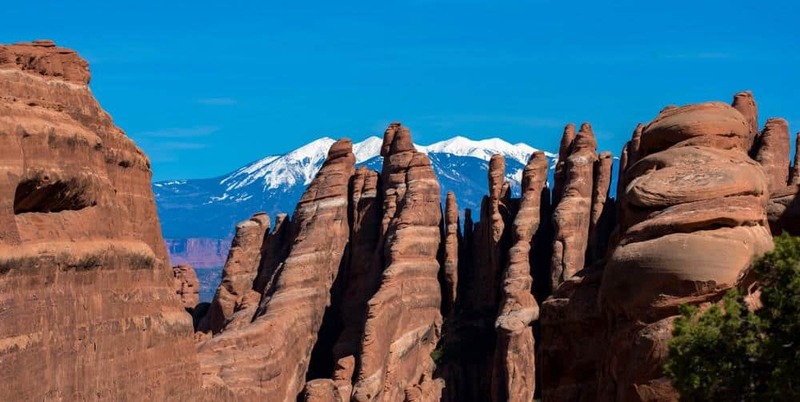 From the Fiery Furnace overlook you see an area thick with fins, spires and arches. 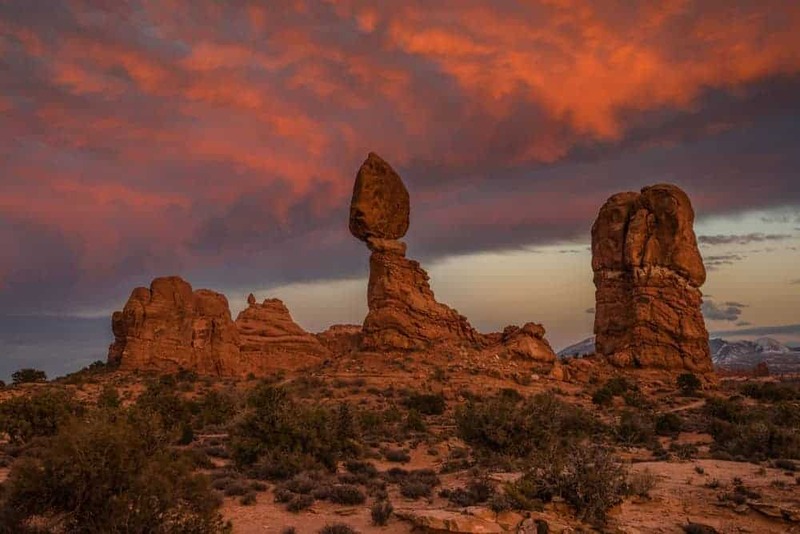 BEST TIME TO PHOTOGRAPH the Fiery Furnace is sunset. 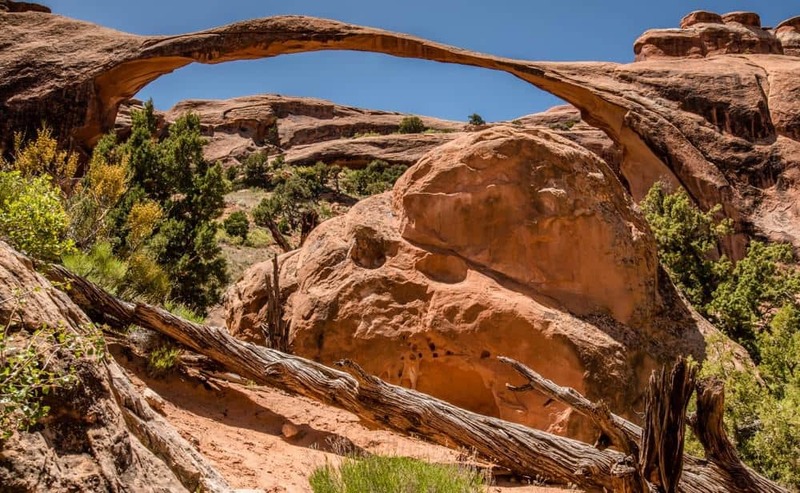 Hike 1.6 miles along the Devil’s Garden Trail to see Landscape Arch. It is longer than a football field and the thinnest part of the archway is 8 feet thick. As you walk along the trail, the arch shows you different perspectives. There used to be a short trail that went under the arch, but falling rock from the underside has made it too dangerous for visitors to walk beneath the arch. No shadows on the arch – late spring and early summer in early morning – the rest of the year at mid-morning. Photograph various angles of the arch – straight on, to the left and to the right. BEST TIME TO PHOTOGRAPH Landscape Arch is sunrise and early morning. 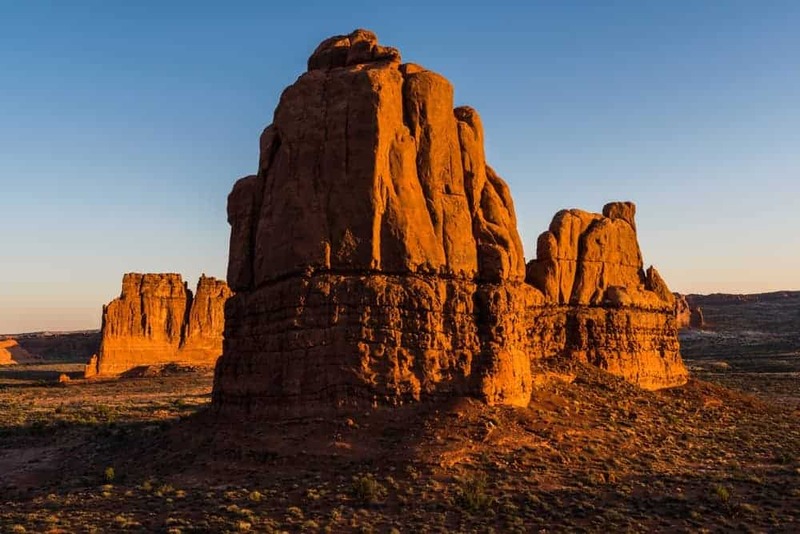 The Devil’s Garden hiking trail is 7.2 miles round trip, including all spur trails, making it the longest maintained trail and Arches National Park hike. The largest concentration of significant arches in the world is found in the Devil’s Garden area. 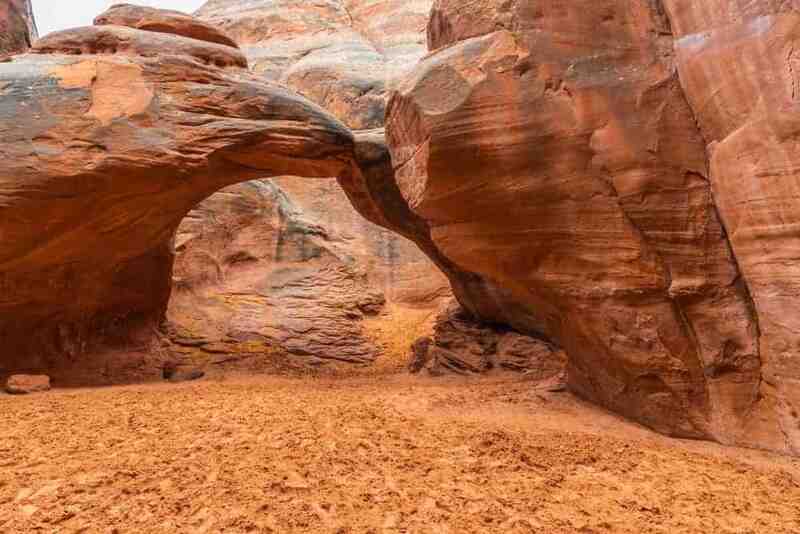 Most tourists hike an easy 1 mile to the famous Landscape Arch. 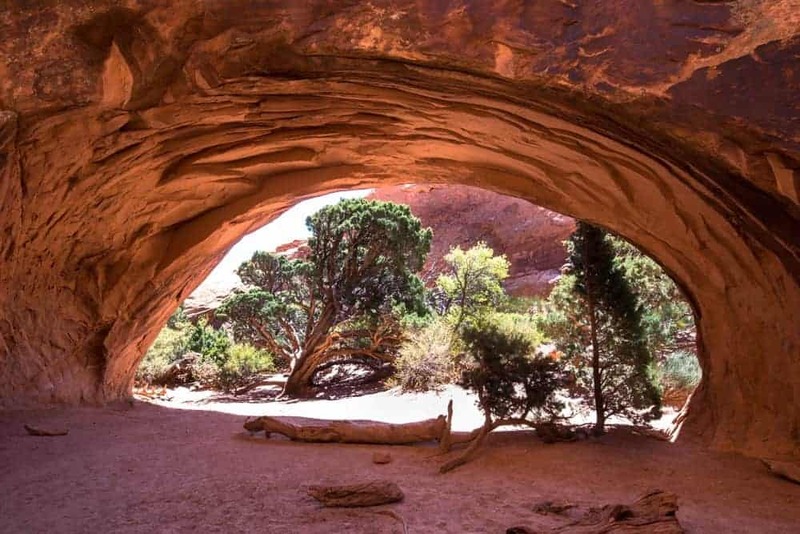 There are spur trails to see Tunnel Arch and Pine Tree Arch before arriving at Landscape Arch. Those who want some adventure will continue along the trail that requires climbing up and over long, narrow sections of slickrock, called fins, with steep drop-offs. This section of trail leads to Navajo Arch, Partition Arch and Double O Arch. Navajo Arch: Capture the front, back and under-arch views. Partition Arch: Capture the front and back sides (there is a steep drop-off on the back side). Double O Arch: Pass through the lower opening of the arch and climb the slickrock on the other side to photograph the arch with sky as the background. Photograph the fins along the trail as these are just as amazing as the arches! BEST TIME TO PHOTOGRAPH the Devil’s Garden area arches is sunrise and early morning. The Windows area and arches can be seen from the parking lot, but to appreciate their magnitude, hike inside and around the arches. 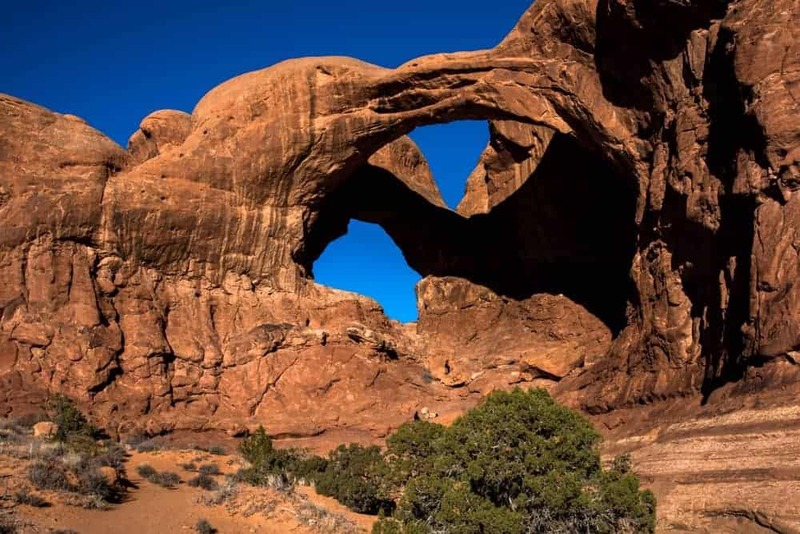 The easy, 1 mile round trip Arches National Park hike takes you to the North and South Windows, also known as the Spectacles. Walk along the primitive trail from the South Window to the back side to see a more attractive view of these arches. Get here early if you want photos of the arches without people. 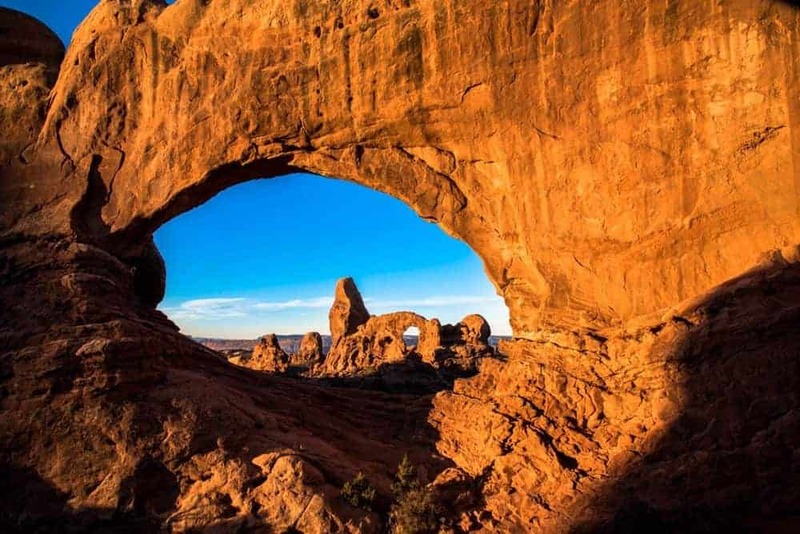 The Windows area is easily accessible and very popular Arches National Park photo spot. Find a foreground element for a photo with only the larger North Window. Add context by having a person on the slope of the window, but if you don’t time your visit, you’ll have 50 people in this shot and that’s not ideal. BEST TIME TO PHOTOGRAPH the spectacles is early morning – and the North and South Windows is late afternoon. Turret Arch is one of the best sunrise spots in Arches National Park since you can see the light dancing across the rocks. Photograph Turret Arch through the North Window. Capture various perspectives and images as you walk around and climb Turret Arch. Turret Arch provides a wonderful shape to complement milky way photography. BEST TIME TO PHOTOGRAPH the Turret Arch is early morning or evening for night or milky way photography. Double Arch consists of two arches that share the same stone foundation. It was formed by downward water erosion instead of side-to-side water erosion like most of the other arches in the park. 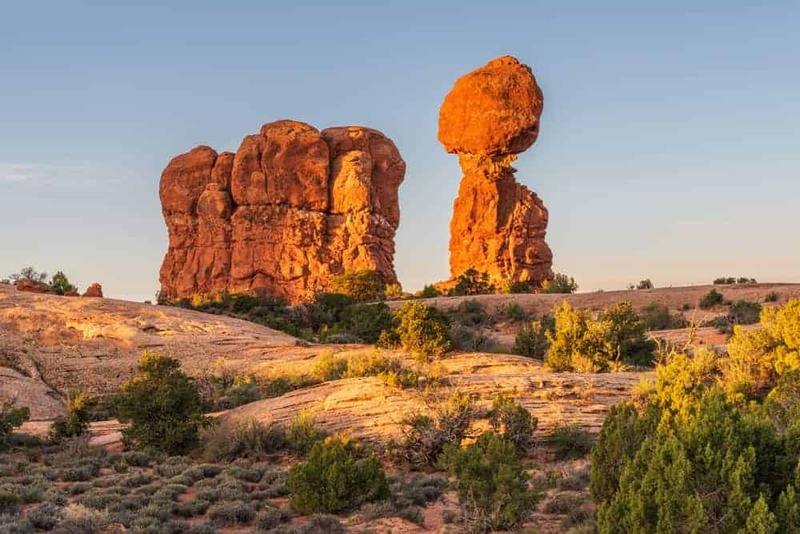 As you hike to Double Arch look to your left to see the Parade of Elephants, a rock formation that resembles a herd of elephants holding each others’ tails. Enjoy the short, leisurely trail. This is a complicated formation that has lighting issues most of the day. Work with the shadows, foreground and scale to capture the arches the best you can. If it’s crowded and you don’t want people in your shot, focus on the top part of the arches to create a unique perspective. BEST TIME TO PHOTOGRAPH the Turret Arch is early morning. On a hot summer day, this is one stop in the park that usually has an area to provide shade, cool sand and fun for kids. The easy hike takes you to a sandy area with many places to explore, play and hide. Do not climb on top of the arch as that’s against park policy. PHOTO TIP: The sandstone fins in the area are worthy of photographs too, not just the arch. You can capture wonderful landscape photos at Sand Dune Arch. BEST TIME TO PHOTOGRAPH Sand Dune Arch is early morning or late afternoon when the sun isn’t directly lighting arch between the fins. Skyline Arch sits high atop rocks in the Devils Garden area and it’s visible from many areas of the park. 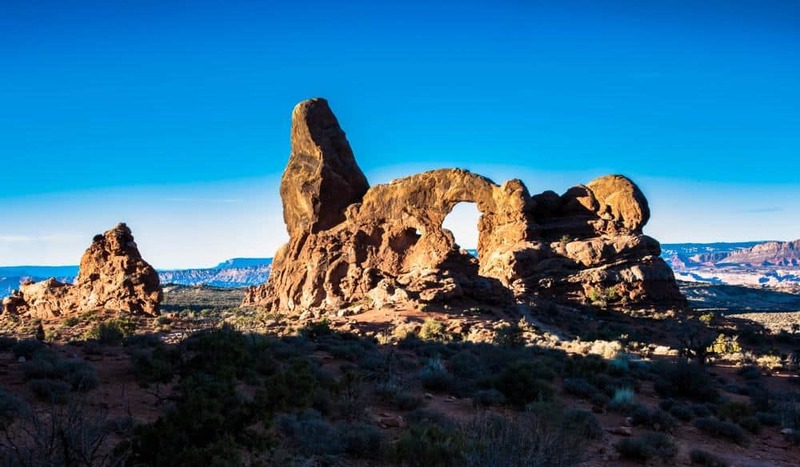 PHOTO TIP: You can take a photo of this arch from the pullout, but we recommend you hike along the short and easy trail to get closer to the arch. BEST TIME TO PHOTOGRAPH Skyline Arch is late afternoon. 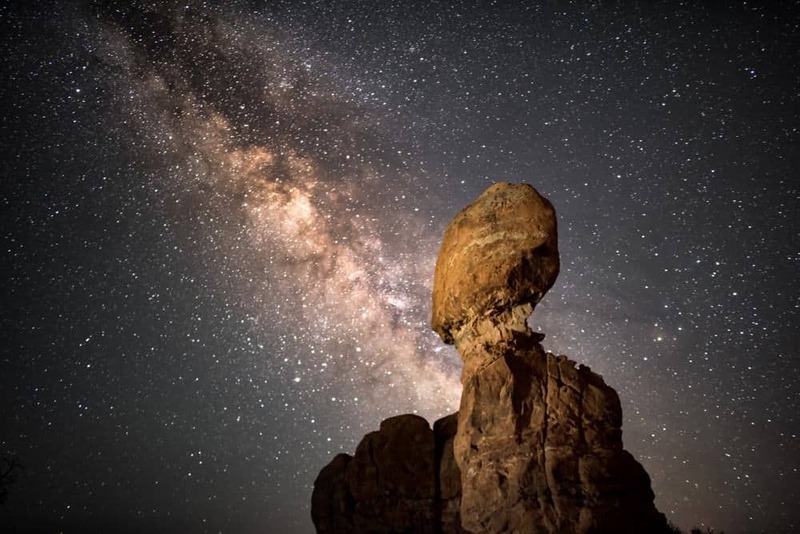 On a clear night, linger in the park after dark and look up to see the sky bursting with stars to see why this park is one of the top Moab night photography spots. Arches is recognized as an International Dark Sky Park. The park’s accessibility, remote location, altitude and weather are why they say “Half the Park is After Dark”. Photographers from around the world come to Arches to photograph the Milky Way. Arches National Park is home to some of the best Moab stargazing spots and is the perfect place to try some Moab night photography. RELATED: How does ISO work for night photography? Visit Booking.com to check reviews and prices on all Moab lodging. Visit TripAdvisor to check reviews and prices on all Moab lodging. Visit Airbnb to check prices and availability of Moab area vacation rentals – (here’s a $40 coupon). Photography Basics Video Series – SUBSCRIBE to our channel to receive notifications when we post future videos! Such stunning photos! I really want to go here, thanks for sharing these fabulous tips! Happy to answer any questions when you get the chance to go! Love the pictures of the night sky. 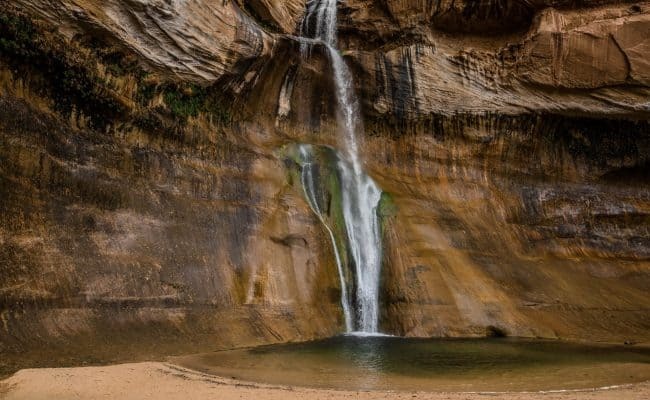 Would love to explore southern Utah soon! I hope you get to visit Southern Utah – and see the amazing night sky. I’m lucky I live so close! Great tips, especially the photography tips. I always try to capture that perfect shooting time. The pictures look incredible. I am relatively close to this and could easily make it a weekend trip. Yes the morning and evening ‘perfect light’ is nice, but we still photograph during the day – you really have to when traveling. You just do the best you can! I have never heard of Arches National Park before, but boy are there some really cool photography spots! I will be keeping it in mind for my next US trip. Thank you for sharing. 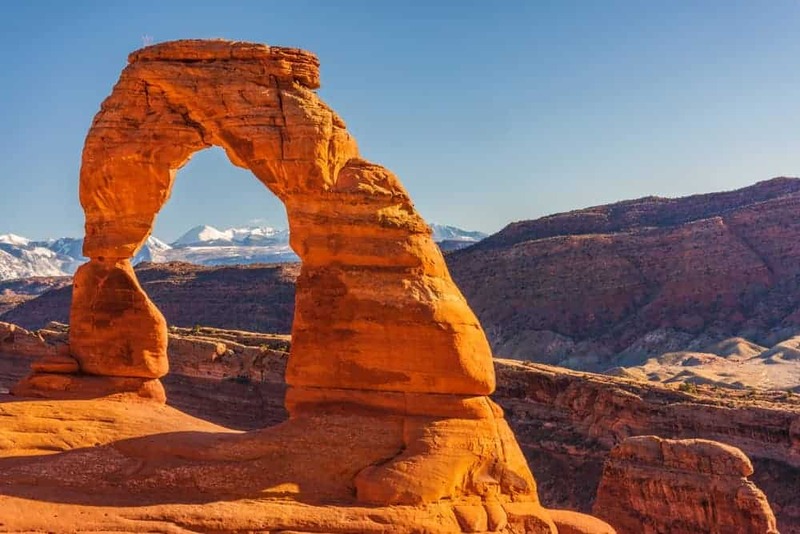 If you ever make it to the US again, the southwest has quite a few National Parks very close together: Arches, Bryce, Zion, Capitol Reef, Grand Canyon….it’s a spectacular area of the US to explore. You might have heard it before, but you have a good insight into photography! That it’s more than just whipping out a cam and taking a snap. I’m not surprised so many photographers and travelers hit this spot! Thank you Viviane. Arches is filled with photo opportunities if you take the time to stop and really ‘see’ the park and the creative inspiration. I was to Utah in 2017. I wish i could live in such a beautiful state. I plan to visit in 2018 any suggestions. I seen Capital Reef, Arches n.p, Zion and suggestions. I was hooked on Moab and busting to go back. Canyonlands near Moab: https://photojeepers.com/category/destinations/canyonlands/ and Bryce Canyon: https://photojeepers.com/category/destinations/bryce-canyon/!! Unfortunately I can’t share a picture in comment otherwise I would have showed you the picture I clicked at Arches. which actually blew few hashtag’s on Instagram and got me like 3 times more likes on that photo. I totally agree with you that this place is the perfect place for photography. It’s just be the last few years that we’ve taken the time to seek out ‘dark sky’ locations to photograph and see the stars. It’s something you should try to do at least once. A star-filled sky is just awe-inspiring! WOW! I loved the photos, especially the stargazing ones. And great to get the tips when it is the best way to go, both season and time for good lighting. We visit this park so often that we wanted to share practical tips based on our experience. And yes, the stargazing is AMAZING there! Great photography and tips. Love the natural rock formations. Thank you. 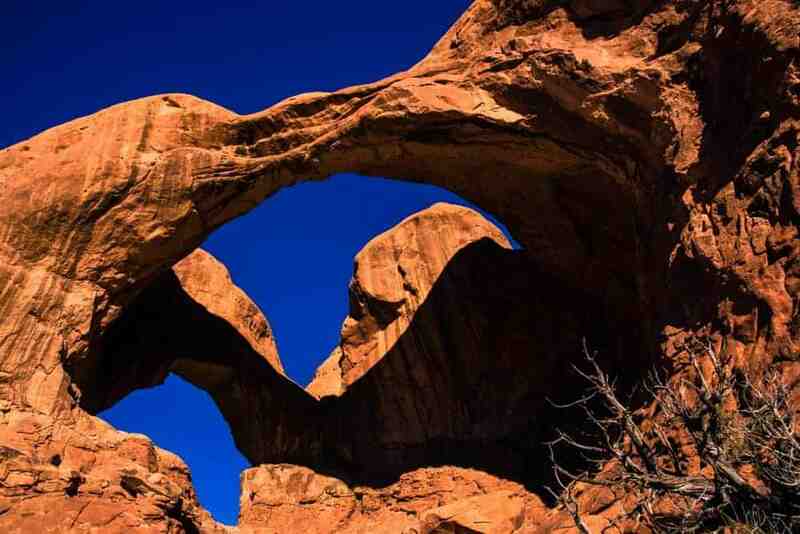 This formations at Arches are simply amazing! The structures are massive, and it does help to have people in the photo to see that. The starry nights are amazing in person! Great pics! Thanks for the inspiration! Thank you, Daniela. We feel photos of places help people visualize the location to help them determine if they want to travel there and what sites they want to see. Inge – nice photo at Turrett Arch with the Milky Way! It is amazing that every time we are in the park after dark, we end up making friends with fellow photographers. So fun!